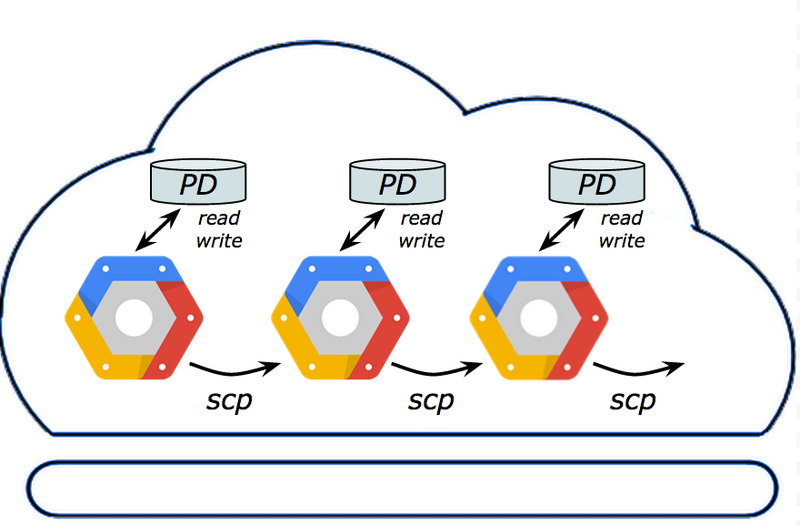 Google Cloud Platform Blog: Move your big data lightning fast and at a low cost! Move your big data lightning fast and at a low cost! Big data applications commonly read data from disk, transform it, then use a tool like secure copy (scp) to move it to another VM for further computation. Scp is limited by several factors, from its threading model to encryption hardware in the virtual machines CPU’s, and is eventually limited by the Persistent Disk read and write quota per virtual machine. It can transfer close to 128MBytes/sec (single stream) or 240MBytes/sec (multiple streams). Create a snapshot from the source disk. Download the snapshot to a new destination disk. Attach and mount the destination disk to a virtual machine. Using Persistent Disk Snapshot you can move data between your virtual machines at speeds upwards of 1024MBytes/sec (8Gbps). That’s an up to 8x speed increase over scp! 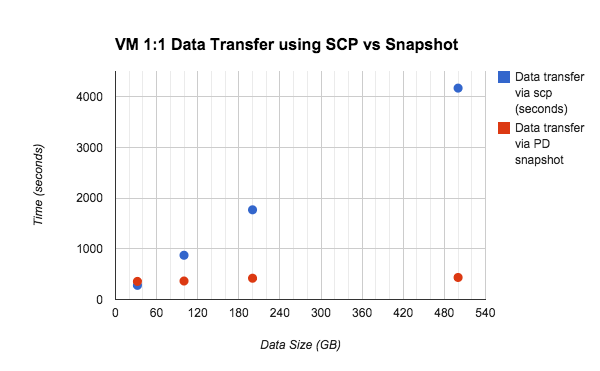 Below is a graph that shows a comparison of moving data with secure copy and snapshots. 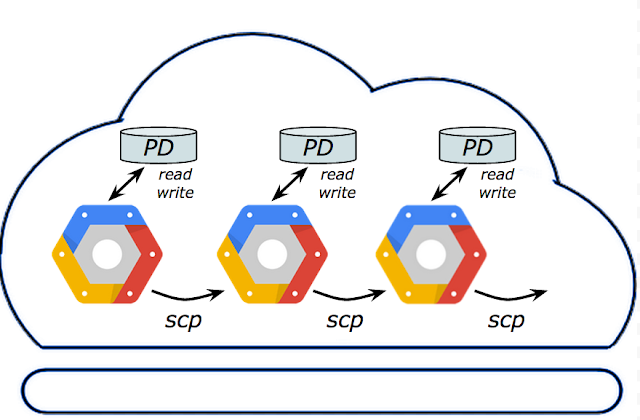 The huge advantage of the snapshot-based approach stems from the performance of Google Cloud Platform’s Persistent Disk snapshotting process. The following graph shows the time it takes to snapshot Persistent Disks of increasing size, along with the effective throughput (PD-SSD was used in this experiment). 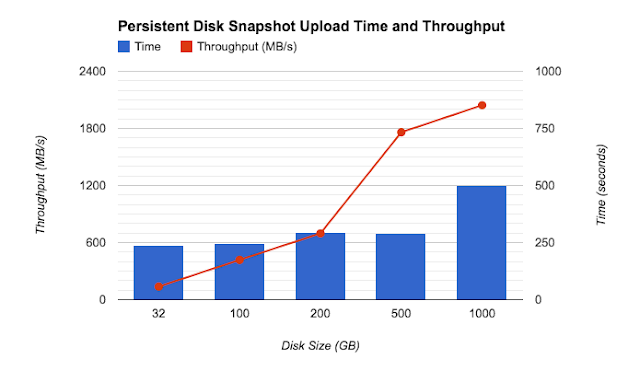 The time it takes to do the snapshot is roughly the same up to 500GB (bars in the graph) and steps up at the 1TB mark. Therefore, the effective throughput (i.e., “speed”) of the snapshot process, which is shown as the line in the graph, increases almost linearly. Google Cloud Persistent Disks Snapshot speed is outstanding in the industry. 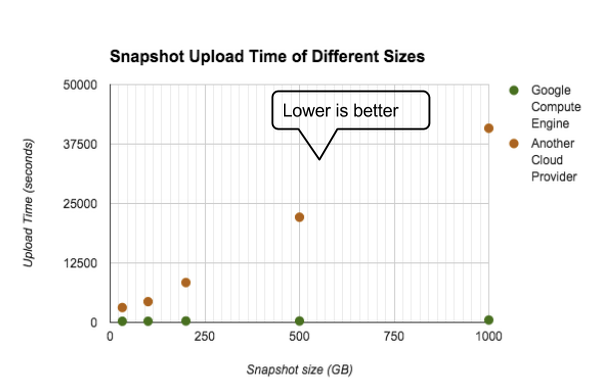 Below is a comparison graph with another cloud provider that also provides snapshots. As you can see, while Google Cloud Platforms upload times remain flat as the size increases, our competitor’s upload time increases as the size increases. Google Compute Engine tests were performed in us-centra1-f using PD-SSD. Snapshot sizes are: 32GB, 100GB, 200GB, 500GB and 1000GB. There is a cost of 2.6 cents/GB/month for taking a Persistent Disk snapshot, which might seem like a lot on top of the hourly virtual machine price for copying data. However the actual average cost comes out to about $0.003 per 500GB of data transferred because the snapshot used for transfer purpose is short lived (under 10min) and its pricing is prorated based on a granularity of seconds. You can delete the snapshot immediately after the transfer is complete. That means for less than a penny you can move a terabyte of data at 8x the speed of traditional tools. For hands-on practice, you can find more about snapshot commands on our documentation, as well as a previous blog about how to safely make a Persistent Disk Snapshot. Happy Snapshotting! All applications need at least some data to function. Big data applications like gaming analytics, weather modeling, and video rendering as well as tools such as flume, MapReduce, and database replication are obvious examples of software that process and move large amounts of data. Even a seemingly simple website might have to copy dictionaries, articles, pictures, and all sorts of data across VMs, and that can add up to a lot. Sometimes that data must be accessible through a file system, and traditional tools like secure copy (scp) might not be enough to handle the increasing data sizes.